Imagine enjoying the outdoors for a few hours more as you prepare dinner by the pool or on the patio. Dusk is such a wonderful time to be outside. The soft hues of the sun setting down and the cooler air moving in. It’s just natural that we would want to extend our outdoor activities a little bit more! Outdoor kitchens are growing in popularity in central Florida. Our custom outdoor kitchens (also known as summer kitchens) turn your backyard area into a great relaxing addition to your home. Imagine building an outdoor kitchen with the comfort and convenience of cooking while entertaining your family and friends in your own backyard paradise. 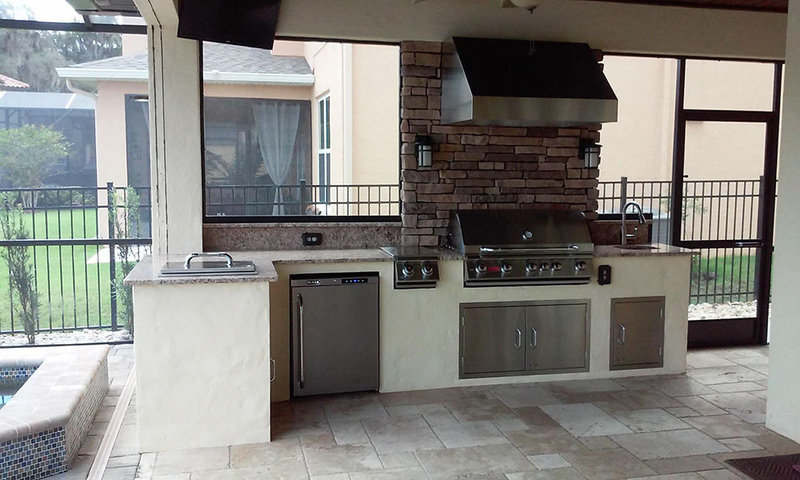 Our outdoor kitchen builders can make your dream kitchen come true in Orlando, FL and surrounding communities. Our outdoor kitchen designers draw and design the kitchen to match your specific needs and space. You can visualize your new outdoor kitchen with our 3d design center. All that’s left is to install the kitchen on your patio, and our outdoor kitchen construction team is ready to build what you’ve seen designed on the computer. Outdoor kitchens bring together people, nature, and food, and it’s hard to beat that combination. If you’ve never tried it, you might be surprised by how relaxing and pleasurable it is to eat home-cooked meals in a backyard oasis. Contact us and get the best in outdoor kitchen contractors. Basic Outdoor Kitchen: a grill, a stove, a table, and some chairs. Custom Outdoor Kitchen: refrigerator, spacious counters, large cabinets, a sink, an ice maker, a pizza oven, a bar, heating devices, and a series of high-end, stainless steel appliances. An island is a possibility too. In fact, the kitchen that you have outside could easily rival its indoor counterpart. With the right outdoor kitchen design and quality construction, you can enjoy your new outdoor kitchen for many years. In fact, when you sell your house, you’ll probably find that the outdoor kitchen significantly boosts the price. Cooking outside keeps the interior of your home cooler, which helps to lower your air conditioning expenses. What’s more, it ensures that your house is free of odors and smoke, as well as provides additional entertaining area on your patio. 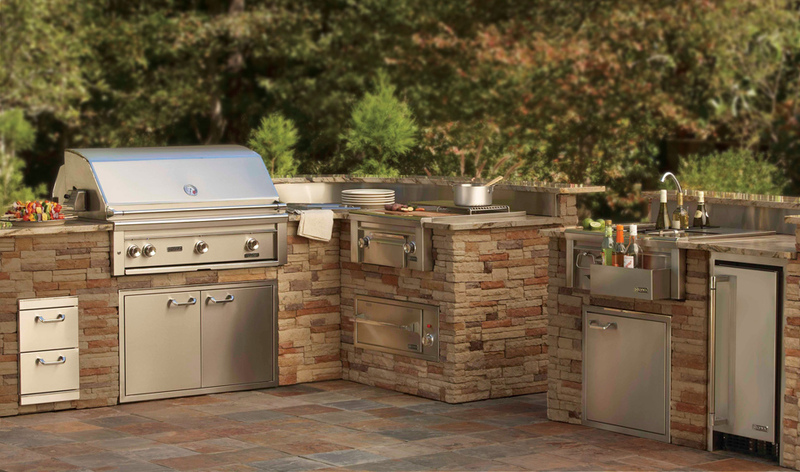 As you consider the placement of our outdoor kitchen, it’s ideal to have it under your roof line on your patio. You could also place this room close to your swimming pool, and your guests could splash around until their meals are served. The drifting aromas of the food will surely delight everyone in the pool. Further, keep in mind that grilled entrees are usually one of the healthiest methods of food preparation. Additionally, you can sit outside when it rains, without worrying about bringing the party indoors. Building an outdoor kitchen is a little like turning your home into a luxury resort. Doing so will let you spend many happy evenings outside with your family and friends.